My students have embarked on a creative writing unit, specifically murder mystery creative fiction. Last week’s blog post I wrote about the quest and the three laps students partake in to flex their creative writing muscles. This blog post dives deep in the first lap, descriptive writing and narrative of a place. The setting is extremely important to a story. It can have immense effects on the plot and the characters. It can also establish the atmosphere, or mood, of a story or a specific scene. The setting establishing this mood allows the reader to relate to the characters within a story. Let’s look at an example in literature. Note the vivid imagery used to describe the setting. How does the author encompass all of our senses to bring us into the place this novel is set? In my classroom I would give my students this excerpt and ask them to mark up the text noticing how place, time, landscape, weather, and atmosphere are described to establish the setting. Then, students would sketch out a visual of the setting described in the passage. We look at examples for models in descriptive writing about setting for our own writing to stretch our writing, take risks, and try something new. In mystery writing setting helps to propel the mystery and can be the best place to leave clues for readers. Directs the reader’s attention to significant details of character or action. Setting can be used almost symbolically. It can stand for a mood, a state of mind, an emotion. Plays off character against the environments in which they live and act. Characters (and their motivations, desires, hopes) may be juxtaposed against the settings in which they appear. They may occupy the setting comfortably, or be uncomfortable in the settings in which they’re placed. Enhances the suspense and mystery (establishing mood and tone) in a piece of writing. To help my students write with depth and lots of description about their setting, they storyboarded the setting. This involved drawing out the setting and writing additional details to help stretch the setting details and give readers a clear sense of place. I thought why not bring some creative fiction writing into the mix in lieu of an essay based on our reading. Hence, students are writing their own murder mystery short stories. I set up three “laps” around this genre to support my student learners. Show the setting of your creative murder mystery fiction through the effective use of sensory details (see, taste, smell, hear, feel) to help readers imagine and live inside this setting. Write a minimum ONE page (double spaced, 12 point Alegreya Font) description of the place and setting of your murder mystery. Use word choice to create a believable, consistent narrator’s voice. Choose a tone for your story that matches your intent; use literary devices such as metaphor and simile to expertly craft words and sentences. Emphasize words or phrases that are most important; how do you want us to feel about this place? Ronnie had heard stories about the mansion before, not good ones, but it was honestly much more chilling in person. The gate at the entrance was made of black matte barbed wire, shaped and crafted with jagged swirls and it went up about 12 feet. The mansion itself was something out of a horror story. The window were cracked, the bricks a faded mauve, and the front entrance had two large knockers, gargoyles, with huge black empty eyes. Utilizing a graphic organizer created by the teacher or designing your own story map, plot out the key elements of your murder mystery short story. Be sure to include: detective, the crime, the victim(s), the suspects, rising action, clues, climax, capture, solution, and resolution. Create your own short story based around a crime or a mystery. Your story must be AT LEAST one page, but NO MORE THAN four pages. You MUST be sure to include all the parts of the story we have discussed (characters, setting, clues, red herrings, clues). 11. All of a sudden I was trapped! A six-part scripted podcast series. 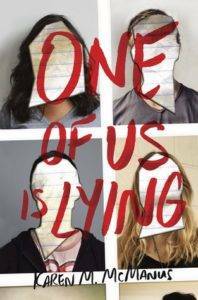 Teen detective Tig Torres investigates the twisted mystery of the infamous Lit Killer murders. But as she gets closer to the truth, the killings, each based on murder scenes from classic literature, begin all over again…with her as the final target. It’s Baltimore, 1999. Hae Min Lee, a popular high-school senior, disappears after school one day. Six weeks later detectives arrest her classmate and ex-boyfriend, Adnan Syed, for her murder. Yes, this is the Cormoran Strike series that J.K. Rowling writes under a pen name. This book is basically The Breakfast Club meets Gossip Girl. Five students walk into detention, but only four walk out alive. The murder victim is Simon, the creator of Bayview High’s very own gossip app, and all four suspects have a motive.